An overview of all transducers in our range can be found in our category GPS & Chartplotters, sorted by manufacturer. When you buy a new multifunction display or other instruments, a transducer is most likely not included. The reason being that there are a number of different models, which vary in material, frequencies and utilized technology. Which transducer is right for you? Thru-hull transducer or transom transducer or maybe an in-hull transducer? This guide will provide you with all the necessary information regarding different transducer types, their advantages and disadvantages and how they are installed. A transducer is virtually the heart of a fish-finder or multifunction display. The transducer transmits sonic waves and receives their echoes; the time needed between transmission of the impulse and receipt of the echo allows the transducer to determine the type of surface and the depth of the water in that area. Transducers housings are available in different materials. A general recommendation concerning the most suitable material is impossible. It all depends on your boat’s material. Plastic transducers housings are suitable for GRP or metal hulls. A plastic transducer should, however, never be used in combination with a wooden hull. Wood twists, expands and contracts and can damage the plastic, which can result in a leak. (Stainless) steel or corrosion-resistant transducers housings are especially suitable for aluminum steel hulls in order to avoid electronic corrosion. For installation inside an aluminium metal hull, aninsulating fairing block is additionally necessary. Steel transducers are not suitable for boats where electrical installation is made with positive ground. Bronze transducers are suitable for wooden or GRP hulls. Avoid them for aluminum hulls. The combination of aluminum with bronze, especially in conjunction with saltwate. There are different types of transducers with different possibilities when it comes to installation. Below we will provide you with detailed information regarding thru-hull, in-hull as well as transom transducers, their respective advantages and disadvantages, including instructions for installation. A thru-hull transducer obtains good results even at high speeds. The thru-hull transducer should be installed parallel to the water’s surface and should have a maximum tilt of 5-10 degree, otherwise the depth cannot be measured correctly. To ensure this, you can use a fairing block, for example when installing the transducer on one side of a V-hull. Transducers with a tilt angle are also available as an alternative, for example 12 or 20 degrees. This way the transducer beam is directly directed at the ground and thus can receive a stronger echo and deliver more accurate depth data. Never install the transducer near thru-hull fittings, drain holes, chine edges, outboard see valves, sacrificial anodes, speed sensors, keels, propellers or propeller shaft systems. There is a danger of currents in these areas, which could distort the measuring results. For trailer boats the installation location should be chosen in such a manner that the transducer will not be damaged during crane operation or trailer transports. For this reason, the transducer should not be installed near shoring, keel rollers or all trailer components. For installation chose a spot where the transducer cannot be disturbed by interferences from other sources of power or sources of radiation, such as for example a second transducer, ignition, light machine or engine. The lower the level of background noises, the better the potential gain setting of the fish-finder, which will result in a more accurate display. Choose an area in the hull that is easily accessible, with sufficient space for the size of the transducer shaft and for fastening of the nut. On motorboats, the transducer should be installed at the beginning of the last third of the hull. Ideally you can find a spot near the midship line and in the area of the first stringer, preferably directly before the engine compartment. For this type of installation of the transducer, the boat has to be on land. Never install a thru-hull transducer when the boat is still in the water. As soon as you have determined the right location for installation of the transducer, drill a test hole of approximately 6 mm in vertical direction to the water line. If you are satisfied with the location of your test hole, drill a hole from the outside of the hull that is large enough for the diameter of the transducer. Make sure that the hole is vertical to the water line. Remove any old antifouling and primer around the hole. Sand the area down to the hull and clean it from the inside and outside, ensuring that the sealing agent will stick to the hull. Stick the transducer through the hole from the outside as a test to ensure that everything fits correctly prior to sealing. The transducer has to be vertical to the water line in order to send down a signal in a straight angle. This way only you will receive an accurate measuring result (see illustration). The transducer and the nut might be in a slanted angle toward the hull. This needs to be corrected by means of a skeg or fairing block to avoid tilting of the nut inside the hull. 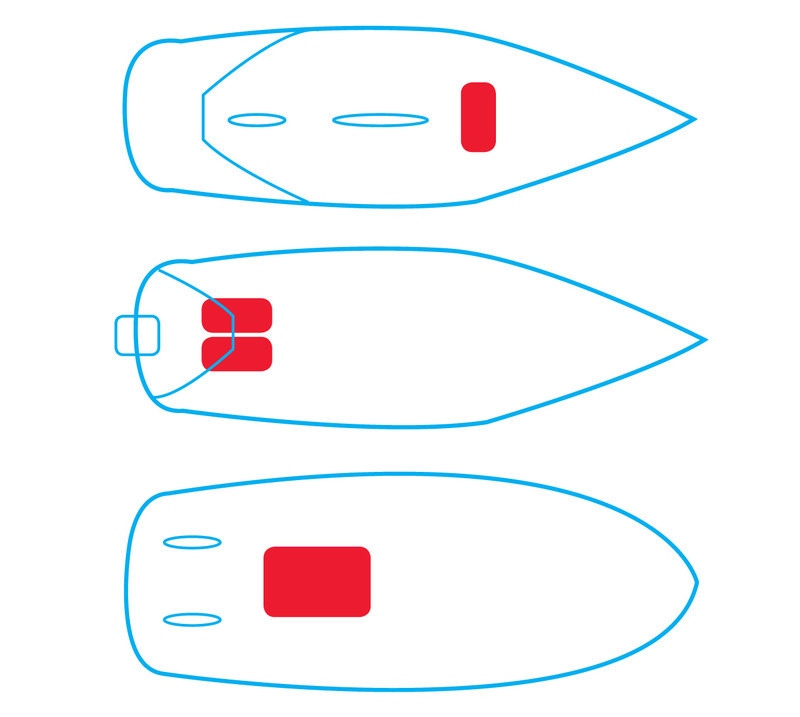 Tip: mark the hole on the hull by first of all placing the drill in left-hand rotation. This will prevent chipping of the gelcoat. For securing the transducer on your boat, you should cover the hull as well as the transducer (including thread) generously with sealing compound. Afterwards, insert the transducer from the outside and tighten the screw. Make sure not to tighten the nut too firmly. Since the nuts are frequently made of plastic, overwinding is easy; this can potentially lead to water ingress into the hull. Make sure that sufficient sealing compound has been squeezed out. This means that your transducer has been glued sufficiently. Tip: In order to avoid having to remove the sealing compound from the hull again, you might want to apply masking tape to the hull prior to installation of the transducer and cut the shape of the transducer head out of the tape. After securing the transducer with sealing compound, you can easily pull off the masking tape with the squeezed-out sealing compound. Let the sealing compound dry. When running the cables, make sure this is done properly, e.g. with protective tubes in the keel area or along the floor. Never shorten or cut the cable without consulting an expert. This can cause damage to the transducer or lead to a loss in quality. Immediately after going to water with your boat, check the area around the transducer for leaks. Be aware that small leaks are not necessarily visible immediately. Never leave your boat in the water for longer than three hours without having checked the condition again. Areas between sleeve and transducer that are not sealed can be repaired in a makeshift manner with a dummy plug. However, you should pull the boat out of the water again as soon as possible. Remove the transducer on land and check whether nut and transducer sleeve are still in perfect condition before you proceed with step 3 of the installation process again. This type of transducer is probably the most popular. Transom transducers can be easily installed with a mount on the outside of the stern. These can be used on wooden, fiberglass, aluminum or steel hulls. The advantage of this transducer compared to the thru-hull transducer is an easier installation. The transducer can also be adjusted after installation. An adjustable stern traveler provides a range of installation options. Transom transducers can fold up (depending on installation) during slipping of the boat or when coming in contact with driftwood. Thus, there is no danger of damage. During this type of installation, it is important that the sonar transducer is preferably installed in horizontal direction and is always located inside the water. The stern of some sailboats is lifted out of the water during heeling. A transom transducer is not suitable for these boats. The location is always below the waterline. The installation location is not behind the boat propeller, since this could lead to disruptions in the transducer signal. Usually transom transducers are installed on the starboard side, since the propellers usually move toward the bottom on this side. The distance to the turning radius of the propeller should at least be 75 mm. At high speeds, the transducer will not be disturbed by air bubbles of potential currents. The transducer sits a little lower than the hull’s lower edge, allowing for a uniform flow towards the transducer. In some exceptions, installation can be done a little higher, in order to protect the transducer against driftwood. If these requirements cannot be fulfilled, choose a different transducer. Mark the drill holes for the transducer mount and drill the holes in the respective areas. Insert the screws and secure these additionally with sealing compound. Place the transducer into the mount and align it. Drill a hole into the hull, preferably above the waterline, in order to feed the cables into the boat’s interior. Feed the transducer cable with plug through the hole and seal the hole with sealing compound. You may also install a Scanstrut bushing as a precautionary measure. Make sure the cables are running properly, e.g. through protective tubes in the keel area or along the floor. Never shorten or cut cables without consulting an expert. This can cause damage to the transducer and lead to a loss in quality. Make sure that the transducer centre line (yellow line) is at ground level (black line). No hole has to be drilled into the hull for this type of transducer. The transducer is simply glued to the interior side of the hull (with silicone or epoxy) and the signal is transmitted through the hull. This type of installation is only possible in GRP boats, since the properties of GRP with regard to ultrasonic waves are similar to that of water. The big advantage of in-hull transducers is that the hull is not damaged and that installation can also be done when the boat is in the water. In addition, the transducer is protected against fouling and damage from stones or driftwood. An in-hull transducer is a good choice for trailer boats, boats with tiered hull design and other types of high performance hull designs, since there is no water resistance or potential for fouling with this type of transducer. The only disadvantage of this type of transducer is a weaker performance due to the transmission of signals through the hull. 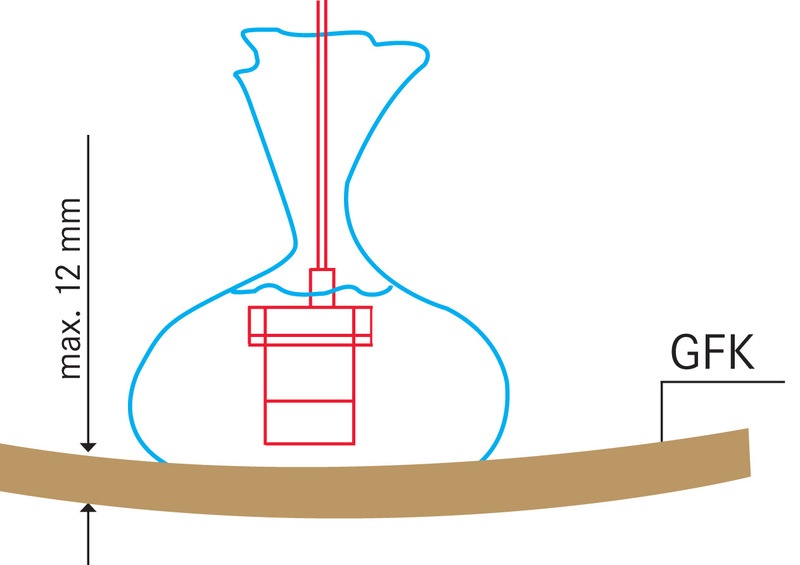 The maximum measurable depth is for example lower than with a transom transducer. It also needs to be taken into consideration that there are no in-hull transducers with integrated temperature sensors. Choosing the right installation location: The most suitable installation location varies for the different types of vessels. The following illustration includes our recommendations in the red shaded areas. Regardless of the type of vessel, the transducer should preferably be installed upright. The transducer should have a maximum tilt of 5-10° in order to not distort the measuring results. 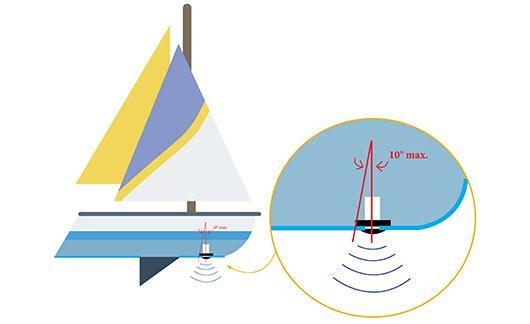 In case of sailboats, it is also important that the transducer beam can transmit from the keel without obstacles. With a solid GRP hull, you need to make sure that the laminate is free of air bubbles or metal inclusions. Fill a plastic bag with water. Place the transducer inside the bag and close it. 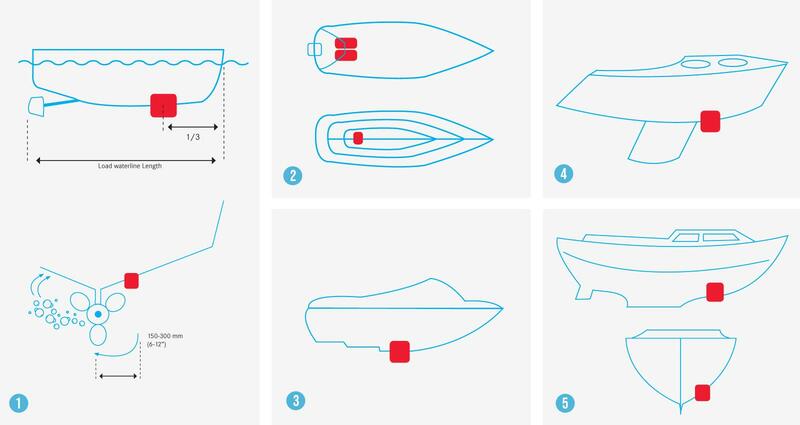 In order to find the most suitable location, place the bag in different locations on the hull. Connect the display and observe what is displayed for different water depths. Clean your hull in the desired installation location and remove paint and dirt; sand the hull as well as the transducer with sandpaper. Follow the manufacturer’s instructions when mixing the epoxy adhesive. Apply the adhesive (or silicone) generously on the hull and transducer. Make sure that no air is trapped below the material. Secure the transducer on the hull as vertically as possible. Depending on the consistency, spread the adhesive about 1 cm thick around the transducer. Let the area dry for a while. In addition to the different transducer types and their installation, there are also various technologies for each type of installation; these can very much affect the quality and display results. The traditional sonar operates with pre-configured frequencies. These are usually between 50 kHz and 200 kHz. The lower the frequency, the smaller the transmission beam and as a result a deeper measurement. In turn, the higher the frequency, the higher the transmission beam, which results in a shallower measurement. The resolution with high frequencies is higher than with lower frequencies. At higher speeds, it is recommended to choose higher frequencies as well. A frequency of 200 kHz is recommended for water depths up to 60 meters. Starting at 60 meters, we recommend a frequency of 50 kHz or 80 kHz. Dual frequency fish-finder combine low and high frequencies and thus offer advantages of both systems. High frequency scanning sonar devices such as the Garmin Down Vü and the Lowrance StructureScan HD can scan areas with very high frequencies and thus create photographic images. You can choose between 455kHz for larger areas and 800kHz for smaller areas and a higher resolution. Raymarine CHIRP SideVision™, Garmin SideVü and Lowrance StructureScan HD can also receive images left and right from the boat instead of only directly below the boat. A sonar or a transducer with Forward Scan Technology is capable of displaying the ground in front of your boat in 2D sonar images. This technology comes in very handy when looking for a suitable spot to anchor and also helps with not running aground in the process. Das CHIRP Sonar ist die modernste Form von Fishfinder-Systemen. Im Gegensatz zum traditionellen Sonar arbeitet die CHIRP Sonar Technologie nicht mit fest eingestellten Frequenzen, sondern variiert permanent in einem großen Frequenzbereich. Die vom CHIRP Sonar ausgehende Energie ist bis zu einhundert Mal größer als die eines traditionellen Sonars, was zu mehr Energiereflektion des Zieles führt. Due to increased energy reflection by the target, the CHIRP sonar offers a large improvement in regard to resolution and accuracy at greater depths. Another advantage of a CHIRP sonar is an improved identification of targets, since information is transmitted in several frequencies, instead of only one. As an example, individual fish that are closely swimming next or on top of each other can be identified in this manner. In addition, living organisms can easier be distinguished from objects in the water. CHIRP sonar devices are clearly less susceptible to currents. The CHIRP system creates its own frequency range for receiving echoes. 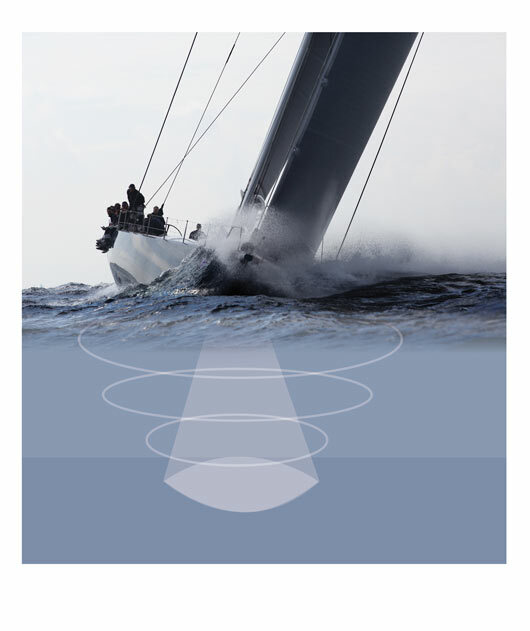 This allows the CHIRP system to distinguish between true sonar echoes and disturbances. This technology is also equipped with improved target separation, due to which fish can easier be distinguished from their surroundings. Displays the ground structure accurately in every detail at a wide viewing angle. The lower the frequency, the smaller the absorption of the signal. This way the signal can travel farther before becoming too weak. The beam angle here is wider and can easily spread out and cover a large area. A lower frequency range is suitable for measuring greater depths of more than 60 meters. The resolution and target definition as well as susceptibility to noise is lower for these transducers than with high frequencies. This frequency is ideal for locating fish in shallow waters. This frequency offers the highest resolution, even at high speeds, and makes it easy to distinguish fish from objects. However, it should be taken into consideration that the depth of the measurement decreases with increased frequencies. This frequency range is only recommended for water depths of up to 60 meters. Displays an almost photorealistic image of the ground at a wide viewing angle and a shallow depth. A CHIRP transducer with a frequency of 455 kHz displays the detailed structure of the seabed at a wide viewing angle. At 800 kHz, the transducer transmits almost photorealistic images of the subsurface at a wide viewing angle and shallow depth. In addition to the above, you should also consider what type of data you would like to receive from your transducer. Are you looking for depth information or details regarding the speed or temperature? Multifunction transducers that combine all these features in one are available. The individual sonar transducers also differ with regard to performance. The strength of a transducer signal (ping) is measured in watts RMS (Root Mean Square, effective value). The higher the performance, the higher the watt RMS value, and as a result improved transmission e ven in deep or dirty water, including more detailed images.